And by "nice cup of ginger tea" I mean about 72 ounces of beer and then lie down especially after I have to call AT&T ... again. Is anyone happy with their cell phone provider? If so, let me know because I'm willing to play for another team. I asked Steve Carell what he thought about AT&T's customer service. I spent nearly 2 hours talking to them last weekend trying to get a problem solved. I was then told Sunday morning that my issue had been escalated and a specialist would be in touch in 3 days to take care of my problem. Any guesses on who hasn't called me back? I guess they are busy taking care of their other customers. Have a great weekend. Thanks for stopping by. Talk soon. 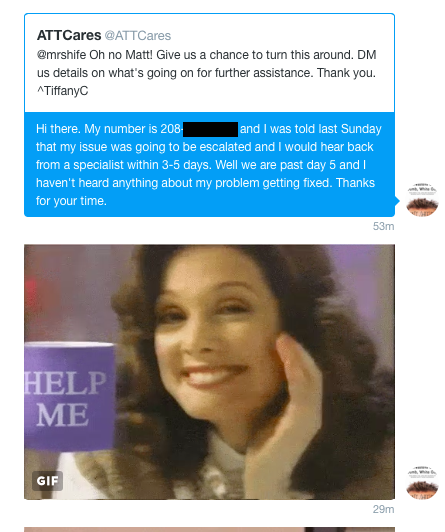 I took to the internet and complained on Twitter directly to AT&T. We are making some progress but the verdict is still out. cones of shame. We are rapidly running thru J's bonus. I've never liked AT&T. We've had Verizon for years and have never had an issue. We just have talk/text though, no data plan so I'm sure others will have their own opinions. Good luck! I must be one of the few people left in America who doesn't have a cell phone. 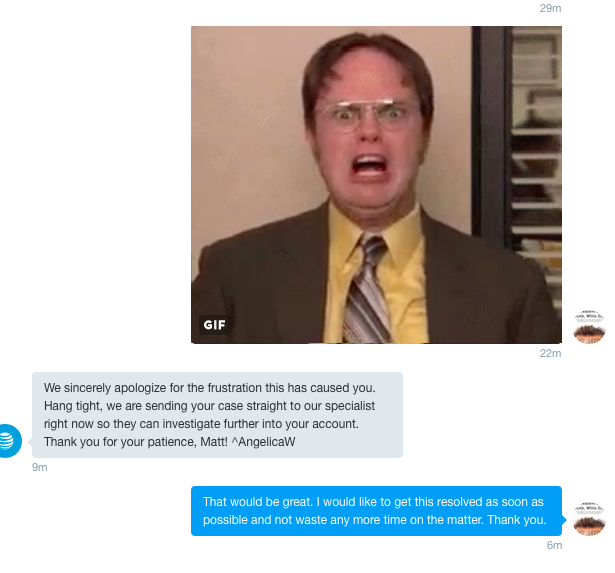 We have a (Canadian) provider that is sometimes great, sometimes bad. Just be persistent. And get the names of all the employees you talk to. Gives you a bit of leverage/lets them know who to tune up. How frustrating! My cell phone service is okay,it's the landline people who cause the most trouble. A lot of people have discontinued landlines... think I might do the same. Hang in there, Matt, don't despair too much! wow! can that dog dance or can that dog dance! how's kyle holding up with doomsday just around the corner?